With under a week away till halloween, are you organised for your parties yet, maybe you need sound system hire surrey. Or do you need some LED uplighters to give your house or party that green or orange spooky feel, or do you need a smoke machine to really give that foggy effect. well at LSC we have all the equipment to make your halloween parties extra special. 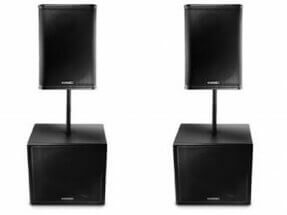 Are you looking for speakers to play your spooky toons on, we have the QSC HPR122I Powered speakers, These are very easy to setup up and are multi device compatible, which means very easy to connect to Ipods,Laptops,Mobile phones. well if you really want to set the eerie feeling then you cant go wrong with a smoke machine or a haze machine, once again these are very easy to set up and can be set up to go off at set intervals or can set off manually via the remote controls. Prices start from £20 upwards, get yours booked today. So today led uplighters are something you would normally associate with weddings but LED uplighting can change the whole look of your home if your decorating it for halloween or if you are having a halloween party you can set to a green which we feel looks most spooky, or orange or even ultraviolet which will light up the kids costumes a treat. We do two types of LED uplights, 1st the powered uplighter which needs to be connected to a plug socket but multiple lights can connected by a link lead called daisy chaining. 2nd is the battery powered LED uplighters, these do not need any power cables as these have batteries and can last up to 9 hours,. Ultraviolet or U.V Lighting is also perfect for halloween as most of the costumes today really glow when under U.V lighting, we have all seen the skeleton costumes with the mask, these look amazing once U.V lighting is used, plus these days you can get U.V paints and even balloons now that glow in the dark. We have a number of different U.V effects but they all do the same thing but with different coverages. Prices start from £20 upwards. And if you are after even more effects for your party, how about a laser ? you will really look great dropping your best Thriller moves through the lasers. or maybe some festoon or fairy lights to light up your house or venue, or just a good disco light effect such as a strobe light to mimic lightning, whatever your needs we will always be happy to assist you especially for sound system hire surrey and also covering London and the surrounding counties for all your hire needs.